1. Broken Open begins with this quote from Anaïs Nin: “And the time came when the risk to remain tight in a bud was more painful than the risk it took to blossom.” Have there been times in your life when you felt the pain of your own resistance to change? What did you do? Did your longing for blossoming become stronger than your fear of change? Are you in one of those periods now? If so, what are the risks of making a change, and what are the risks of staying the same? 2. We all know people who say their cancer or divorce or bankruptcy was the greatest gift of a lifetime—that until the body or the heart or the bank was broken, they didn’t know who they were, what they felt, or what they wanted. It took a Phoenix Process to teach them wake them up. We also know people who did not turn their misfortune into insight. Instead they became more bitter, more reactive, more cynical. What do you think is the difference between these two kinds of people? 3. Would you characterize yourself as a Bozo on the Bus? Why do you think we hide our vulnerabilities and self-doubts from one another? Why do we try to keep the secret of our true selves hidden, when in reality, that secret is what Rumi calls the Open Secret? And how does hiding out from one another hinder us from turning a difficult time into a Phoenix Process? 4. The author uses many poems and quotes to illuminate her ideas about using difficulty to help us grow and awaken. Discuss the following quotes. What do they mean to you, and to a specific challenge you are facing now? What is that knocking at the door in the night? 5. In Broken Open the author introduces us to people who have endured tremendous suffering and have used their difficulties to understand life better and to find joy in the ashes of a Phoenix Process. In Part II, we meet Victor Frankl in Auschwitz; Judi and Marion as they deal with illness; Ram Dass recovering from a stroke; Glen losing his beloved son; and Rabbi Yehudah Fine picking up the pieces after a near-fatal accident. How do their stories help you navigate the terrain of your own life story? 6. A translator of Dante’s Inferno wrote: “The purpose of the Pilgrim’s journey through Hell is precisely this: to learn all there is to know about sin, as a necessary preparation for the ascent to God.” Do you think that an experience with a Shaman Lover—be it an actual lover, an addiction, or any force that brings one into the underworld—is a “necessary preparation for the ascent to God”? 7. In Part IV we meet the author’s children and extended family. What lesson can “The Great Movement of the Couch” teach any parent? 8. Another character from Part IV, Eli, brought home to the author Mother Teresa’s edict that “the problem with the world is that we draw the circle of our family too small.” Our friendships and families, our marriages and work relationships, and our communities and nations—all of them are circles begging for more spacious boundaries. What is the relationship between the way we expand the circle in our personal lives and the way we affect change in the greater world? 9. What does “practicing death” mean to you? 10. Have you been visited in your dreams by loved ones who have died? 11. Which of the tools in the Toolbox section of the book appeals to you most? How might meditation, psychotherapy, or prayer help you turn a difficult time into a Phoenix Process? "Never again will a painful experience break me down. 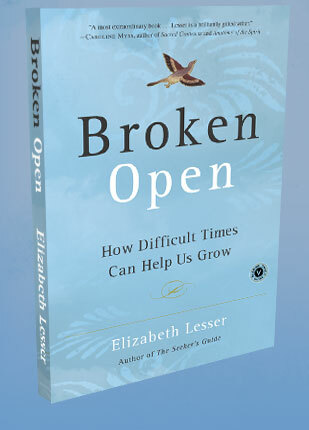 Instead, I'll use Elizabeth's book to help me bread open into greater strength, acceptance, and awakening."